Charles Brandon, 1st Duke of Suffolk, 1st Viscount Lisle, KG (c. 1484 – 22 August 1545) was the son of Sir William Brandon and Elizabeth Bruyn. Through his third wife, Mary Tudor, he was brother-in-law to Henry VIII, King of England. His father was the standard-bearer of Henry Tudor, Earl of Richmond who seized the throne as Henry VII. Suffolk died of unknown causes at Guildford. Charles Brandon was brought up at the court of Henry VII. He is described by Dugdale as "a person comely of stature, high of courage and conformity of disposition to King Henry VIII, with whom he became a great favourite." Brandon held a succession of offices in the royal household, becoming Master of the Horse in 1513, and received many valuable grants of land. On 15 May 1513, he was created Viscount Lisle, having entered into a marriage contract with his ward, Elizabeth Grey, suo jure Viscountess Lisle. The contract was ended and the title was forfeited as a result of Brandon's marriage to Mary Tudor in 1515. He distinguished himself at the sieges of Thérouanne and Tournai in the French campaign of 1513. One of the agents of Margaret of Savoy, governor of the Netherlands, writing from before Thérouanne, reminded her that Lord Lisle was a "second king" and advised her to write him a kind letter. At this time, Henry VIII was secretly urging Margaret to marry Lisle, whom he created Duke of Suffolk (on 4 March 1514), although he was careful to disclaim any complicity in the project to her father, Maximilian I, Holy Roman Emperor. After his marriage to Mary, Suffolk lived for some years in retirement, but he was present at the Field of the Cloth of Gold in 1520. In 1523 he was sent to Calais to command the English troops there. He invaded France in company with Floris d'Egmont, Count of Buren, who was at the head of the Flemish troops, and laid waste the north of France, but disbanded his troops at the approach of winter. Brandon was appointed Earl Marshal of England in 1524, a position previously held by Thomas Howard, 2nd Duke of Norfolk. However, in 1533 he relinquished the office to Thomas Howard, 3rd Duke of Norfolk, "whose auncesto[ur]s of longe tyme hadde the same until nowe of late." After Wolsey's disgrace, Suffolk's influence increased daily. He was sent with Thomas Howard, 3rd Duke of Norfolk, to demand the Great Seal from Wolsey; the same noblemen conveyed the news of Anne Boleyn's marriage to King Henry, after the divorce from Queen Catherine; and Suffolk acted as High Steward at the new queen's coronation. He was one of the commissioners appointed by Henry to dismiss Catherine's household, a task he found distasteful. His family had a residence on the west side of Borough High Street, London, for at least half a century prior to his building of Suffolk Place at the site. Charles supported Henry's ecclesiastical policy, receiving a large share of the lands after the dissolution of the monasteries. In 1544, he was for the second time in command of an English army for the invasion of France. He died at Guildford, Surrey, on 24 August in the following year. At Henry VIII's expense he was buried at Windsor in St George's Chapel. Charles Brandon took part in the jousts which celebrated the marriage of Princess Mary Tudor, King Henry VIII's sister, with King Louis XII of France. Later, on King Louis XII's death in 1515, he was accredited to negotiate various matters with the King; and was sent to congratulate the new King, Francis I of France, as well as to negotiate Princess Mary's return to England. Love between Charles and the young Dowager Queen Mary had existed before her marriage, and King Francis I roundly charged him with an intention to marry her. King Francis, perhaps in the hope of his wife Queen Claude's death, had himself been one of Mary's suitors in the first week of her widowhood, in which Mary had asserted that she had given him her confidence in order to avoid his overtures. King Francis I and King Henry VIII both professed a friendly attitude towards the marriage of the lovers, but Charles had many political enemies, and Mary feared that she might again be sacrificed for political considerations. The King's Council, not wishing to see Charles Brandon gain further power at court, were opposed to the match. The truth was that King Henry was anxious to obtain from King Francis the gold plate and jewels which had been given or promised to his sister Mary by King Louis XII as well as the reimbursement of the expenses of her marriage with King Louis; and he practically made his acceptance in Charles's suit dependent on Charles obtaining them. However, when Charles was sent to bring Mary back to England, King Henry VIII made him promise that he would not propose to her. Once in France though, Charles was persuaded by Mary to abandon this pledge. The couple wed in secret at the Hotel de Clugny on 3 March 1515 in the presence of just 10 people, among whom was King Francis I. Charles announced their marriage to Thomas Wolsey who had been their fast friend. Technically, this was treason as Charles Brandon had married a royal princess without King Henry's consent. Thus, King Henry VIII was outraged, and the privy council urged that Charles should be imprisoned or executed. He was only saved from King Henry's anger by Wolsey and from the affection that the King had for both his sister and for him. Hence, the couple got off easily and were charged only with a heavy fine of £24,000 to be paid to the King in yearly installments of £1000, as well as the whole of Mary's dowry from King Louis XII of £200,000, together with her plate and jewels. Nonetheless, the fine was later reduced by the King. They were then openly married at Greenwich Hall on 13 May 1515 in the presence of King Henry VIII and his courtiers. 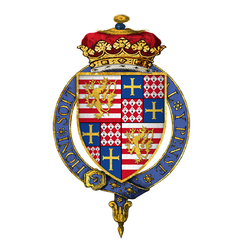 The Duke of Suffolk had been already twice married, to Margaret Neville (the widow of John Mortimer) and to Anne Browne, to whom he had been betrothed before his marriage with Margaret Neville. Anne Browne died in 1511, but Margaret Neville, from whom he had obtained a declaration of nullity on the ground of consanguinity, was still living. He secured in 1528 a bull from Pope Clement VII that assured the legitimacy of his marriage with Mary Tudor. Princess Mary Tudor died on 25 June 1533, and in September of the same year, Charles married his ward, the 14-year-old Catherine Willoughby (1519–1580), suo jure Baroness Willoughby de Eresby. Catherine had been betrothed to his eldest surviving son, Henry, Earl of Lincoln, but the boy was too young to marry. Not desiring to risk losing Catherine's lands, Charles married her himself in the end. By Catherine Willoughby, he had his two youngest sons who showed great promise, Henry (1535–1551) and Charles (c. 1537–1551), who later became Dukes of Suffolk. However, they eventually died of the sweating sickness within an hour of each other. In about 1536–1543, Charles gave his London residence Suffolk Place, rebuilt by him in fine Renaissance style in 1522, to King Henry VIII in exchange for Norwich Place on the Strand, London. Before 7 February 1507, Charles Brandon firstly married Margaret Neville (born 1466), widow of Sir John Mortimer (d. before 12 November 1504), and daughter of John Neville, 1st Marquess of Montagu (slain at the Battle of Barnet) by Isabel Ingaldesthorpe, daughter and heiress of Sir Edmund Ingaldsthorpe and his wife Joanna Tiptoft, by whom he had no issue. The marriage was declared void about 1507 by the Archdeaconry Court of London, and later by papal bull dated 12 May 1528. Margaret (née Neville) subsequently married Robert Downes, gentleman. Lady Anne Brandon (1507–1557), who married firstly Edward Grey, 3rd Baron Grey of Powis, and after the dissolution of this union, Randal Harworth. Lady Mary Brandon (1510 – c. 1542), who married Thomas Stanley, 2nd Baron Monteagle. Charles was then contracted to marry Elizabeth Grey, 5th Baroness Lisle (1505–1519), and was thus created 1st Viscount Lisle of the third creation in 1513, but the contract was annulled, and he surrendered the title before 1519 or in 1523. Lady Frances Brandon (16 July 1517 – 20 November 1559), who married Henry Grey, Marquess of Dorset, by whom she was the mother of Lady Jane Grey. Lady Eleanor Brandon (1519 – 27 September 1547), who married Henry Clifford, 2nd Earl of Cumberland. After Charles Brandon's death in 1545, his widow Catherine married Richard Bertie. Sir Charles Brandon, who married Elizabeth Pigot, widow of Sir James Strangways. Frances Brandon, who married firstly William Sandon, and secondly Andrew Bilsby. Mary Brandon, who married Robert Ball of Scottow, Norfolk. The romance between Mary Tudor and Charles Brandon is fictionalised in When Knighthood Was in Flower, by American author Charles Major writing under the pseudonym Edwin Caskoden. It was first published by The Bobbs-Merrill Company in 1898 and proved an enormous success. At least three movies have been based on this novel. A 1908 motion picture of the same name or under the title When Knights Were Bold was directed by Wallace McCutcheon. This is considered a lost film. He is portrayed by Forrest Stanley in the 1922 film adaptation When Knighthood Was in Flower, directed by Robert G. Vignola, and by Richard Todd in The Sword and the Rose, an account of his romance with Mary Tudor in 1515. The Reluctant Queen by Molly Costain Haycraft presents another fictionalised version of the relationship between Brandon and Mary Tudor. Brandon is briefly fictionalised in the historical novel The Last Boleyn by author Karen Harper. Brandon is portrayed by actor Henry Cavill in the Showtime series The Tudors. He serves as a confidant to best friend Henry VIII and therefore a number of Brandon's storylines are fictionalised for dramatic purposes. For example, he is married twice and is estranged from second wife Catherine Willoughby Brandon, Duchess of Suffolk (Rebekah Wainwright). He takes on an official mistress, a French expatriate (played by Selma Brook), who cares for him up until his death. Also, he only has one son here, Henry (Michael Winder), presumably a representation of Henry Brandon, 2nd Duke of Suffolk. He is a character in the novel Mary, Queen of France by author Jean Plaidy. He appears as a character in the novel The Lady in the Tower by author Jean Plaidy. He appears as a character in the Man Booker Prize winning novel Wolf Hall by Hilary Mantel, and in its sequel, Bring Up the Bodies. He is portrayed by actor Richard Dillane in the BBC drama Wolf Hall, based on Mantel's book. In the novel The Serpent Garden by Judith Merkle Riley, Brandon is portrayed as an immensely strong but rather dimwitted noble with a poor sense of spelling. He is the main character in the novel Brandon Tudor Knight by Tony Riches. ^ Brandon's mother Elizabeth was a granddaughter of Sir Maurice Bruyn (d. 8 November 1466), and  by Elizabeth Darcy (died c.1471), daughter of Sir Robert Darcy of Maldon, Essex. Before her marriage to Sir William Brandon, Elizabeth (née Bruyn) had been the wife of Thomas Tyrrell (died c. 13 October 1473), esquire, son of Sir Thomas Tyrrell of Heron and Anne Marney. After Sir William Brandon's death at Bosworth, Elizabeth (née Bruyn) married William Mallory, esquire. Brandon had a brother, William, and two sisters, Anne, who married firstly Sir John Shilston, and secondly Sir Gawain Carew, and Elizabeth. ^ a b c Richardson II 2011, pp. 359-60. ^ a b c Richardson II 2011, p. 360. ^ Richardson I 2011, p. 14. ^ a b c d Richardson I 2011, p. 298. ^ Burke 1834, p. 205. ^ Gunn states that Elizabeth Brandon was Sir William Brandon's daughter by an unknown mistress, and that she married Nicholas Arrowsmith. ^ Gunn 1988, p. 46. ^ a b Chisholm 1911, p. 25. ^ a b c d e f g Chisholm 1911, p. 26. ^ Gunn 2015, p. Ixix,xxv. ^ "Survey of London: vol. 25, St George's Fields: The parishes of St. George the Martyr Southwark and St. Mary Newington, Suffolk Place and the Mint, (1955), pp. 22-25". British-history.ac.uk. Retrieved 16 September 2013. ^ a b Cokayne 1953, p. 458. ^ The Picards or Pychards of Stradewy (now Tretower) Castle, and Scethrog, Brecknockshire, (London: Golding and Lawrence, 1878), p. 62 Retrieved 16 September 2013. ^ 'Parishes: Martley with Hillhampton', A History of the County of Worcester: volume 4 (1924), pp. 289-297 Retrieved 16 September 2013. ^ Richardson II 2011, p. 455. ^ Cokayne states that Anne Browne was the daughter of Sir Anthony Browne by his second wife, Lucy Neville; Cokayne 1953, p. 459. ^ "Family Search: Community Trees. British Isles. Peerage, Baronetage, and Landed Gentry families with extended lineage, Robert Ughtred, Lord Ughtred". Histfam.familysearch.org. Retrieved 13 September 2013. ^ Richardson II 2011, pp. 225-6, 340. ^ a b c d e f g h i j k Gunn 1988, p. 94. Burke, John (1834). A Genealogical and Heraldic History of the Commoners of Great Britain and Ireland. I. London: Henry Colburn. p. 205. Retrieved 18 July 2013. Cokayne, G.E. (1953). The Complete Peerage edited by Geoffrey H. White. XII (Part I). London: St. Catherine Press. Gunn, S.J. (1988). Charles Brandon, Duke of Suffolk c. 1484-1545. Oxford: Basil Blackwell. pp. 46–7. ISBN 0-631-15781-6. Richardson, Douglas (2011). Everingham, Kimball G. (ed.). Magna Carta Ancestry: A Study in Colonial and Medieval Families. I (2nd ed.). Salt Lake City. pp. 297–302. ISBN 1449966373. Richardson, Douglas (2011). Everingham, Kimball G. (ed.). Magna Carta Ancestry: A Study in Colonial and Medieval Families. II (2nd ed.). Salt Lake City. pp. 359–60, 455. ISBN 1449966381. Richardson, Douglas (2011). Everingham, Kimball G. (ed.). Magna Carta Ancestry: A Study in Colonial and Medieval Families. III (2nd ed.). Salt Lake City. pp. 225–6. ISBN 144996639X. This article incorporates text from a publication now in the public domain: Chisholm, Hugh, ed. (1911). "Suffolk, Charles Brandon, 1st Duke of" . Encyclopædia Britannica. 26 (11th ed.). Cambridge University Press. pp. 25–26. Gunn, S.J. (2015). Charles Brandon: Henry VIII's Closest Friend. Stroud: Amberley Publishing. pp. Ixix. ISBN 1445641844. "Charles Brandon, 1st Duke of Suffolk". Encyclopædia Britannica Online. Encyclopædia Britannica. 2011. Retrieved 21 October 2011. Pollard, A.F. The Project Gutenberg EBook of Henry VIII. Gairdner, James (1886). "Brandon, Charles" . In Stephen, Leslie (ed.). Dictionary of National Biography. 6. London: Smith, Elder & Co. pp. 218–222.